As promised in this blog post, we're returning to explain how we attempt to collect the eggs and raise damselfish! So, we were talking about raising damselfish from eggs laid right here in our Giant Ocean Tank (GOT). There are two main ways to collect eggs in the GOT. One way is with a floating device (seen above) used at night that picks up the eggs and larvae left behind by pelagic spawners. One such collection from the floating device seems to have collected a larval porkfish (which is not part of the damselfish breeding project but it does show that lots of fish are breeding in the GOT)! The other collecting method is to go to damselfish nesting spots on the coral and scrape or suction the eggs off. Divers track and find the sessile eggs using flashlights and a mirror on a stick since they are often laid on the underside of corals as seen in this previous post. They remove the eggs during the last dive of the day so that the eggs can be quickly sent to Roger Williams University. 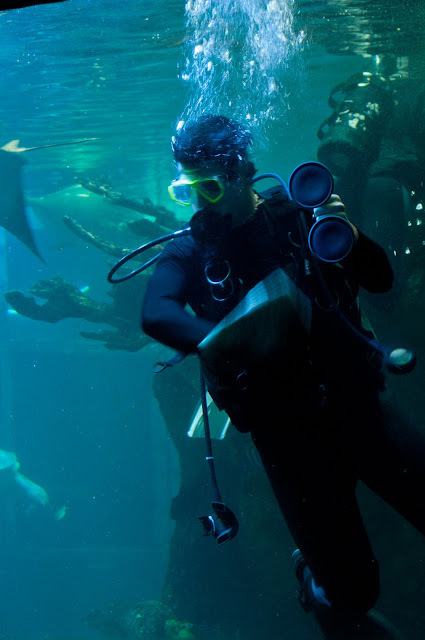 Depending on the species, divers may collect anywhere from 500 to 5,000 eggs at one time and the Aquarium has been able to send out eggs on almost a weekly basis. Although much of this process is still in the trial-and-error stage, Roger Williams has had some success with raising the eggs and larvae and it is hope that at some point a certain percentage of our GOT fish will come from our very own breeding program. Until then everyone on the project is learning a great deal about how to raise many different species of larval fishes, which is contributing to the scientific data available throughout the world. DID YOU KNOW? We received the Edward H. Bean Award from the Association of Zoos and Aquariums for successfully raising a queen triggerfish! Check out a baby picture and video here. Where do baby fish come from? 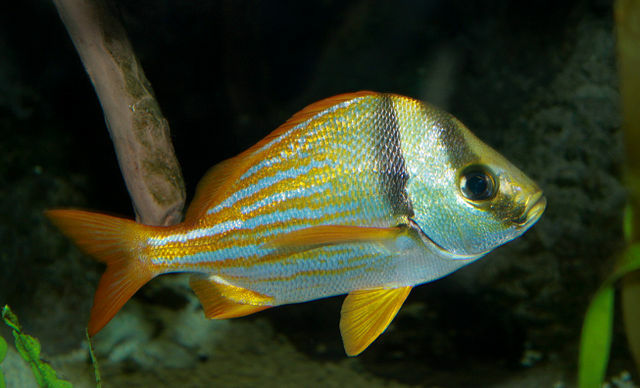 We have found evidence of fish breeding in the Giant Ocean Tank for decades. But until now we haven't focused any efforts on raising these fish. Thanks to a recent partnership with Dr. Andy Rhyne at Roger Williams University we are now actively collecting fish eggs and larvae and sending them off to a lab to be reared. Our main focus currently is on damselfish. Unlike most fish that are pelagic spawners (spawn in open water), damselfish lay sessile eggs (meaning eggs that are attached to a surface). This makes it easy to find and remove them. In addition, the damselfish are very prolific in their egg laying – so much so that we are able to collect eggs on an almost daily basis! So far, we have collected eggs from sergeant majors, yellow-tail damselfish, dusky damselfish, bi-color damselfish, and blue and brown chromis. Note the dark, gray/brown eggs attached to the top piece of coral. These are dusky damsel eggs. For damselfish, the breeding cycle begins with the male picking a spawning site, which he then cleans and prepares. Most damselfishes lay their eggs on a piece of coral, but blue chromis lay their eggs in gravel. Once the site is prepared, the male tries to attract a female by changing colors and swimming excitedly. Some males evens emit clicking sounds. If these tactics work, then the female will deposit up to 20,000 adhesive eggs at the site and the male will then quickly fertilize them. Once fertilized, it is up to the male to defend the eggs and, in some cases, to tend to the eggs. He tends to them by fanning water across them and by picking out dead eggs to prevent a fungus from developing. To defend the eggs the male attacks all intruders that get too close. This includes pulling the divers' hair! The gestation period for damselfish is relatively short – about 3 to 7 days. The eggs change color as they mature. The yellowtail damsels’ eggs start off pink/yellow and become darker as they mature to brown/black. Sergeant majors’ eggs start off purple and lighten as they mature to yellow/clear. Hatched larvae feed on very small zooplankton like copepods and can take up to three years to mature. Keep your eye right here on the GOT blog, we'll be posting about how the eggs are collected in an upcoming blog!